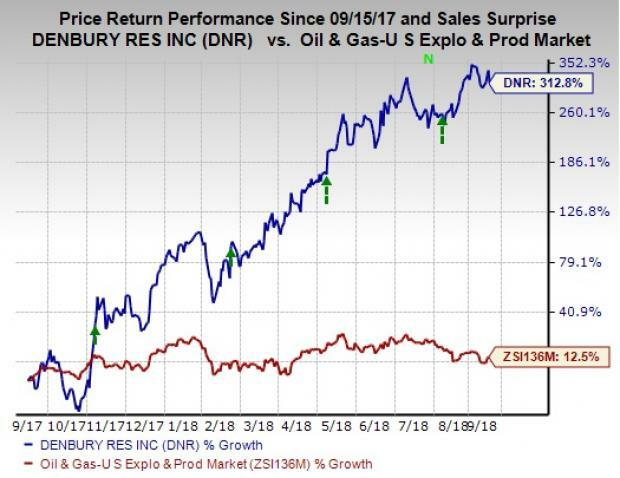 We are upbeat about Denbury Resources Inc.’s DNR prospects and believe that it is a promising pick at the moment. Denbury currently has a Zacks Rank #2 (Buy) and a VGM Score of A. Our research shows that stocks with a VGM Score of A or B when combined with a Zacks Rank #1 (Strong Buy) or #2 offer the best investment opportunities for investors. Let’s delve deeper to analyze the factors that make this oil and gas explorer an attractive investment option at the moment. The company is operating in prospective resources that include the Gulf Coast and Rocky Mountain areas. In fact, using the CO2 enhanced oil recovery technique, the company produces roughly 60% of its output. Notably, through 2017, the company replaced 127% of its production to report proved reserve of 260 million barrel of oil equivalent (MMBOE), comprising 97% crude. Moreover, Denbury Resources’ first-half 2018 production comprised almost 97% oil. The ‘oilier’ nature of its volume mix positions it well to benefit from strengthening oil prices. These positive factors are reflected in the company’s impressive pricing chart. Over the past year, the stock has gained a whopping 312.8%, outperforming 12.5% gain of the stocks belonging to the industry. Other prospective players in the energy space are TC PipeLines LP TCP, Petroleo Brasileiro S.A. or Petrobras PBR and Helix Energy Solutions Group, Inc. HLX, each sporting a Zacks Rank #1. You can see the complete list of today’s Zacks #1 Rank stocks here.